Lama Tsultrim Sangpo is a senior monk at Ka-Nying Shedrub Ling. He was born in Nubri close to the border to Tibet and come to the monastery when he was 12 years old, at which point he started his education there. At the age of 29 he started his traditional 3 years retreat at the Asura cave retreat center in Pharping, Nepal. Since completion of his retreat he stays at Ka-Nying Shedrub monastery, teaching and serving as the main singer for rituals. 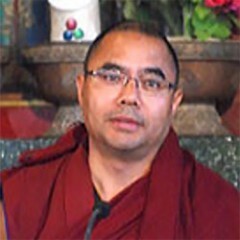 Lama Tsultrim Sangpo is also the resident teacher during Gomde California’s summer teaching season.